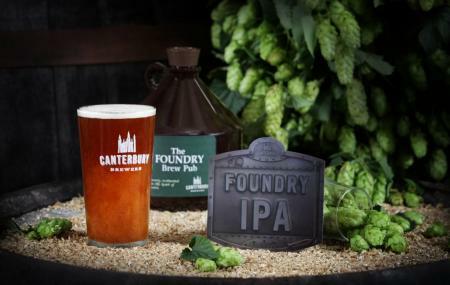 The Foundry is unique craft brewery, restaurant and bar situated in Canterbury. Located within an industrial building, an original Victorian Foundry was converted into this pub. While there, do check out the production of their fine cask ales at the in-house display microbrewery. They also serve scrumptious meals. Love this? Explore the entire list of places to visit in Canterbury before you plan your trip. Fancy a good night's sleep after a tiring day? Check out where to stay in Canterbury and book an accommodation of your choice. How popular is The Foundry Brew Pub? People normally club together Canterbury Castle and Gulbenkian Theatre while planning their visit to The Foundry Brew Pub. Great food, beer and service! Exactly what I was looking for. The area around the brewery was incredibly quaint. If you’re passing through like we were it was a perfect stop. As always some excellent beers and quality food. New premises so much larger for brewing and serving. Staff polite and knowledgeable. Prices not bad although you are paying for quality so not exactly a cheap time. Excellent menu highly recommend the foundry steak and ale pie delicious. A selection of sharing platters are great for all tastes and diets. Then choose from the micro brewery drinks and beers but leave space for dessert. We have been here once before and enjoyed it so decided to come back for a return visit while we were in the area. We were not disappointed. It is very inviting with a lovely choice of on-site brewed ales and I can highly recommend the steak and ale pie. It was the best I have ever eaten and the gravy was just delicious. Thank you. Really good place to meet for food or just a drink, especially if you like locally brewed beer. Food is of good quality and decent sized portions. Plenty of choice on the menu and good for vegetarians too....can recommend both the pies which are made in house especially the cheese leek & sweet potato with mash & peas - no need for a starter or pud! !